Based on a quick assessment, we select the facial care products best suited to your skin type. We use only all natural, chemical-free facial care products made with pure essential oils and healing botanicals. Designed to give your skin on instant and lasting glow. 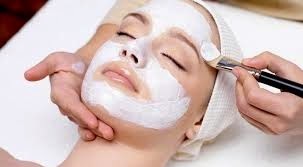 Includes facial massage, cleanse, exfoliation, steam, extraction, a deeply nourishing cream mask and finishing lotion. Repairs and clarifies damaged skin. Includes cleanse, exfoliation, steam, extraction, penetrating serum, eye care, massage on face&decolletage, and softening facial mask. This nourishing facial helps reduce signs of aging. Includes cleanse, exfoliation, steam, extraction, penetrating serum, massage on face and decolletage, eye contour treatment, hydro-collagen mask and vitamin E hand care serum. Reduces puffiness and dark circles, and softens the appearance of fine lines and wrinkles. Active ingredients combined with specialized techniques improve signs of fatigue&aging. Includes warm mineral or cold softening mask.